UTG is continuing to expand our film coverage with the debut of STAY HOME, a recurring review column dedicated to features released outside of movie theaters. Whether it’s VOD, online only, or direct-to-dvd, this feature is dedicated to the films destined for the small screen. If you have a film, or even if you simply know of one we need to cover, let us know! send an email to info@underthegunreview.net with the heading “STAY HOME” and tell us about it! Movie reviews are tough because it’s hard to compare apples to oranges. You can’t possibly judge North by Northwest by the same standards as Old School. it just doesn’t make sense. So when you take a movie like Goon, you have to judge (and rate) the movie in comparison to other sports movies, and more specifically for this one, Slapshot. Slapshot is one of the greatest sports movies ever created and on surface level Goon can be looked at as a very similar film; it’s about a security guard who shakes up a teams terrible hockey playing with his fists rather than his skills. 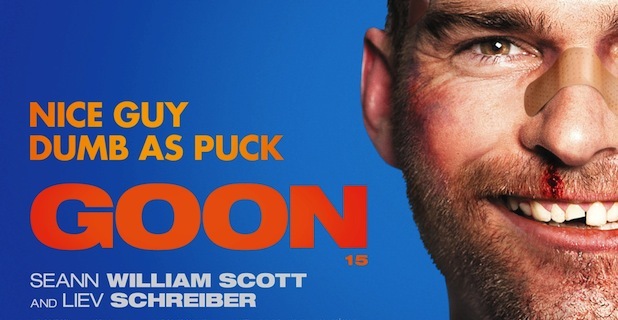 While it’s hard to touch a movie like Slapshot, Goon is a great movie with a lot of heart and laughs that reenergizes the somewhat stagnant sports-comedy genre. The idea behind Goon is covered in the plot synopsis pretty well, but the thing that really stands out is that Goon has a lot of heart to it despite its relatively simple plot structure. The events that happen within the story are relatively easy to guess with even a basic knowledge of sport movies, but even so Goon never feels stale at all. The characters are very easy to love, with Seann Michael Scott (despite his somewhat over-the-top stupidity) doing a fantastic job of drawing the viewer to cheer for his every punch. I really wish there was more of Liev Schreiber in the movie, but I can understand that his lack of camera-time only added to the mystique that is Ross Rhea. The character of Ryan (as done by Jay Baruchel) I found to be highly annoying, but he has his moments. Even though the movie is seemingly low-budget, you wouldn’t be able to tell from the production value of the film. By no means will the movie be winning any awards this year for it’s camera work or editing, but I will admit I really appreciated how the people behind the scenes really took their time to make sure they created the best film with the tools that they had at their disposal. Some of the shots were very creative, and they made sure that when there was blood, there was a lot of it (I love gore in movies, what can I say?). There was a very good blend of dialogue into Goon, but the best moments obviously come from the over the top fight scenes. If you’re a hockey fan, Goon is a movie you should most certainly pick up from your respective VOD service. It provides a lot of laughs but with enough tender moments that your not-as-sports-inclined partner can still find moments to enjoy.